I want you to know that this blog is not only for girls or only for boys. It’s for everybody. The pure reason why it’s purple is because I want it to be a reflection of my soul. But I wanted to say that I know a lot of the mental problems are almost like gender related or generalised. A lot of people think that only girls have some of the mental illnesses and I don’t think that is fair. Guys are troubled sometimes, too. Guys have feelings and deep feelings. Guys have problems. Guys do have eating disorders, too. They cut, they purge, they are depressed, they are suicidal. Yes, I think that more girls tend to have eating disorders than guys but they still do have them. I feel like it is generally more tough for a guy with any kind of mental health issue because often it is not taken seriously. In my opinion the world seems to think that a guy should be strong and fearless and their feelings are almost forgotten because of this. It is a serious issue. Mental Illnesses are not gender related. Guys are valid. Guys’ feelins are important, too. I need you to understand that. This is one of the reasons I loved “To the Bone” – because it had a boy character as well with an eating disorder. I know that Ana is Rex and I know that Mia is Bill, like…I know and you are not forgotten. You matter just as much as all those girls. 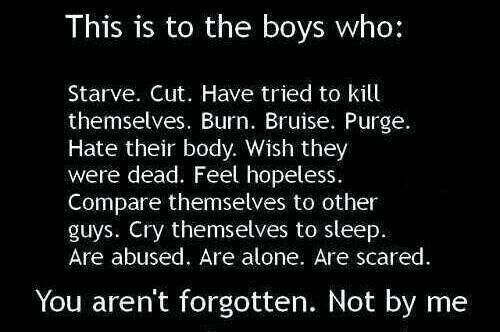 So to the boys: YOU MATTER. YOU ARE IMPORTANT. YOUR FEELINGS MATTER. YOU CAN GET THROUGH EVERYTHING. IT’S ALL GONNA BE OKAY. IT AIN’T GONNA BE EASY OR FAST BUT YOU WILL GET THROUGH WHATEVER YOU ARE GOING THROUGH!